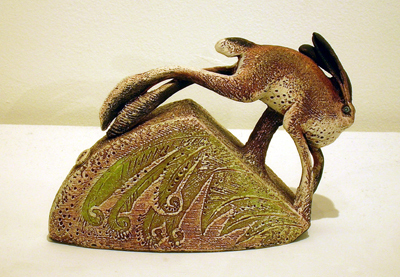 Artist Blandine Anderson set up her ceramic studio in Devon in 1989. 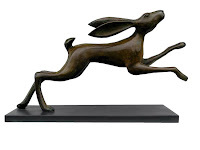 Here she produces figurative sculptures, creating complex compositions of both grouped and single animals. Sometimes the landscape takes on a more predominant role in the composition, constructing unique, more abstract forms and providing her characters with a fabulous stage. Her recent work has been inspired by animals in and around her farm in rural Devon. 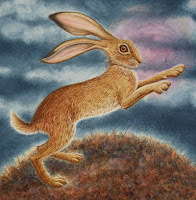 Some works are animal portraits; others are inspired by sources in the world literature, ranging from exotic tales, to the more familiar myth and folklore. All Blandine’s work is handmade, no moulds or other repeat devices are used in the building process. All works are hand built stoneware or porcelain clays. To see more of Blandine Anderson's sculptures, click here.